Rooibos comes from a South African shrub and is also known as Red Tea. This tea is rich in antioxidants and is known for its calming effects. Herbal Red Bush Rooibos Tea contains a mimic of Superoxide Dismutase (SOD), an outstanding antioxidant, which is low in tannic acid and is naturally caffeine free. It is packed with minerals such as Potassium, Calcium, Copper, Zinc, Magnesium and Iron. Recent clinical trials in South Africa and Japan have shown Rooibos tea to help with sleeplessness, mild depression as well as having excellent anti-aging qualities. Superior quality South African herb is rich in antioxidants which helps you lose weight and burn fat naturally. It is naturally caffeine free that makes it apt for all ages and can be taken throughout the day. Rich in antioxidants and known for its calming affects. 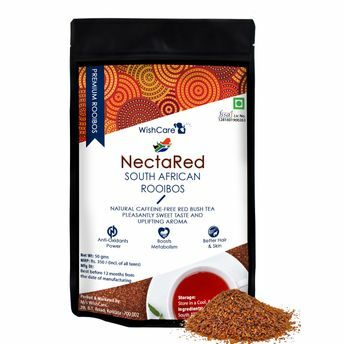 Alternatively, you can also find many more products from the Nectared South African Rooibos Loose Red Tea range.